We specialize in the elimination of Spiders in Gilbert, Chandler, Arizona area. Spiders are common intruders that invade homes year round. Immediate action is recommended. What has eight legs, six (or eight) eyes, and a pair of fangs? It's a spider! The arachnids have long been the subject of fascination, admiration, fear, worship, and study by humans. Spiders are found on every continent except Antarctica and have established themselves in every habitat except air and water. Almost all spiders are carnivores and feed on insects, other spiders, and in some cases frogs and small birds. All spiders use venom to neutralize their prey but most present no danger to humans. Only a few species have venom that can cause medical problems. 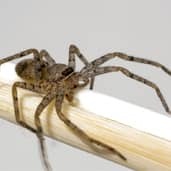 In the U.S., the two most common poisonous spiders are the Brown Recluse with its violin-shaped mark on the top of its cephalithorax, and the Black Widow spiders with its famous red hourglass shape. Like insects and other pests, spiders are creative and relentless at getting into your home. Due to their small size, they easily penetrate screens and barriers and are hard to find once inside. Exterminating and keeping spiders out take more than one treatment, it is an ongoing process. At Simply Green Pest Control, we have trained spider specialists who will be happy to conduct a free evaluation of your property and develop an individual pest control plan to keep spiders and other pests out for good. Snap a picture and submit it for answer using our live chat below. When online you will get an imediate answer.